In the early hours of March 11th, 1879, a fire alarm rang out on the north side of Marion. On North West Street (now North Prospect Street) the house belonging to John Aronhalt, a prominent local businessman, was on fire. Neighbors, some hoping to help and others simply curious, rushed to the scene. This map, taken from the Atlas of Marion County, Ohio (1878), shows the location of Aronhalt’s property just north of Silver Street and adjoining present-day Prospect Street. According to a Marion Star article published later that day, neighbors were saving household goods when the oldest Aronhalt daughter, Nettie, informed them that, “Father is upstairs.” Thinking that he may still be alive, a few men tried to enter his room from inside the house, but the smoke was too thick. Instead they climbed onto a shed roof and entered Mr. Aronhalt’s bedroom through a window where they found his already lifeless body. 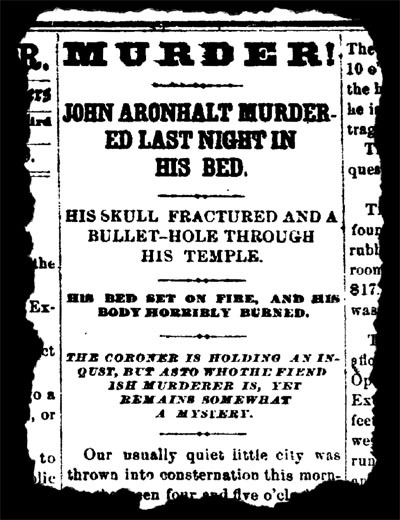 John Aronhalt’s murder was front page news in the March 11, 1879, edition of the Marion Star. It soon became apparent, however, that Mr. Aronhalt had not died as a result of the fire but as a result of a particularly brutal murder. In fact, John Aronhalt’s murder was just the beginning of a tragedy that would grow to include the death of another member of the Aronhalt family – a member who may have held the key to the identity of John Aronhalt’s killer. From the very beginning, it was clear that Aronhalt’s death was not an accident or even a robbery gone wrong. Not only had he been shot in the temple – the pistol was soon discovered beneath the front door steps – but, according to the March 11th edition of the Star, he had received, “a blow to the head with some heavy instrument (supposed to be with a hatchet), which fractured his skull.” Furthermore, the fire was set in John Aronhalt’s bedroom to “consume the body, and thus conceal the guilt of the murderer.” Lastly no money was missing from his wallet, so robbery was also ruled out as a motive. Motive, in fact, was a big part of the mystery surrounding Aronhalt’s murder. The March 12th edition of the Star makes it clear that Aronhalt was respected around town. At the time of his death, he was 53 years old, a father to five children ranging in age from 6 to 25 and a widower, his wife of thirty years having died in 1873. 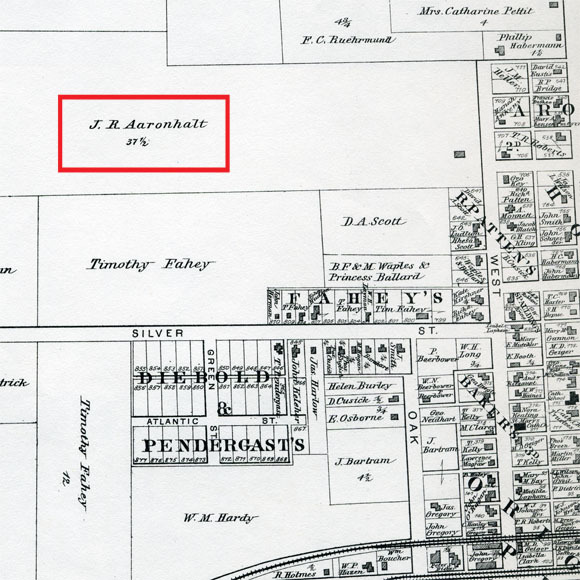 The Aronhalts had originally moved to the northern part of the city after Mrs. Aronhalt inherited 90 acres of land there. They kept 40 acres for themselves and divided the rest of the property into lots which they sold now and then to supplement Mr. Aronhalt’s milk business. If the circumstances surrounding John Aronhalt’s death were shocking, what happened after he died was even more so. In the March 14th edition of the Star, just three days after John Aronhalt died, the headline “Nettie Aronhalt Dead!” appeared on the front page. Nettie, of course, was the daughter who was at home with John Aronhalt when the fire broke out, and she died after ingesting a self-administered poison. Most significantly, the same Star article mentions that she, “died without making a confession.” Of course, the obvious implication is that she had something to confess. 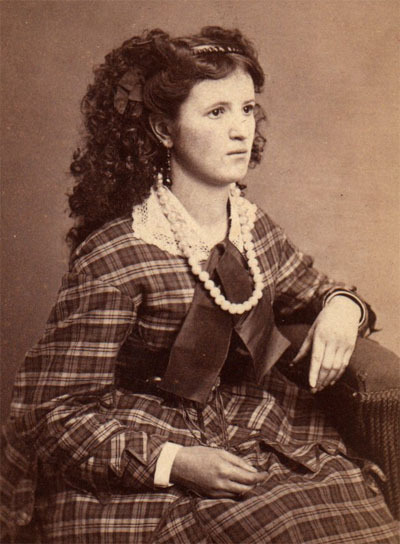 Although the exact date is unknown, Gale Martin of the Marion County Historical Society speculates that this photo of Nettie Aronhalt was taken just a few years prior to John Aronhalt’s murder. Photo courtesy of the Marion County Historical Society. An article appearing in the March 21st edition of the Star, however, isn’t as generous. In fact, the article speculates that Nettie killed her father out of simple greed. That is, she was set to inherit (along with her siblings) her father’s land when he died, and apparently she couldn’t bear to wait around for him to die a natural death. Did Nettie Aronhalt really kill her father? If she did, was it the result of her desire to collect her inheritance early? Or was it the result of some other conflict with her father? We’ll never know. John and Nettie Aronhalt are buried in the Marion Cemetery in unmarked graves, their family’s tragic story largely forgotten and the murder of John Aronhalt forever unsolved.